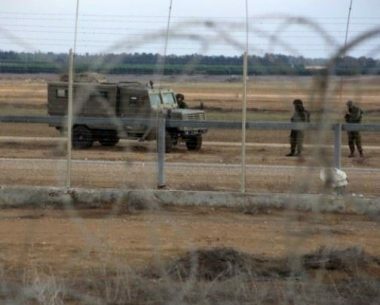 Israeli soldiers abducted, on Saturday evening, two young men in Palestinian men, near the border fence, east of Khan Younis, in the southern part of the Gaza Strip, and fired many live rounds and flares in the area. Eyewitnesses said the soldiers, stationed on military towers across the border fence, shot the two men, on Palestinian lands near the fence. They added that the soldiers, abducted the two wounded young men, who were on Palestinian agricultural lands, and took them to an unknown destination. The soldiers also fired many live rounds into Palestinian farmlands in the area, in addition to firing dozens of flares. It is worth mentioning that the soldiers repeatedly attack and open fire on the Palestinians who approach the fence, an issue that forced dozens not to tend to sections of their lands in the border area.